Anchor users get free hosting and can publish their creations to all the major podcast networks. 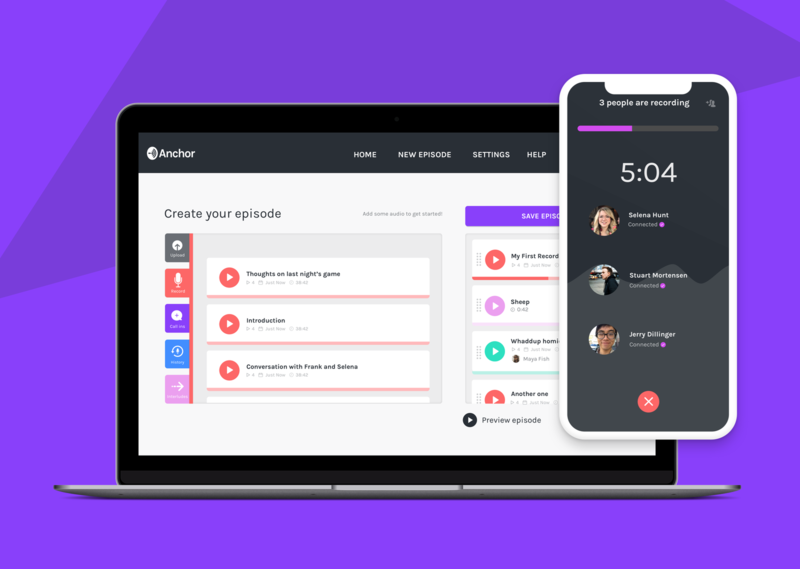 Anchor started off as a social network for audio -- the app let users make quick, impromptu broadcasts to their followers straight from their phone. But the company started seeing more and more people using it to make full-on podcasts, so it added features to push Anchor recordings to Apple Podcasts and Google Play last summer. That turned the app into a one-stop shop for amateur podcasting. The success of that feature has led Anchor to fully re-do its app and mission. Its goal now is to remove all the pain points and costs of making a podcast, from start to finish. To that end, Anchor 3.0 for iOS and Android is an app for recording first and foremost; consuming short broadcasts from your friends is definitely taking a backseat now. For starters, users can record multiple bits of audio and create a library to build out a finished product. Those can be stand-alone recordings, call-ins from your listeners, group recordings, songs from Spotify or Apple Music, transitional audio effects from Anchor's library and more. Once you have all the bits you want, you can arrange them with a drag-and-drop interface and prepare to publish it for all to hear. 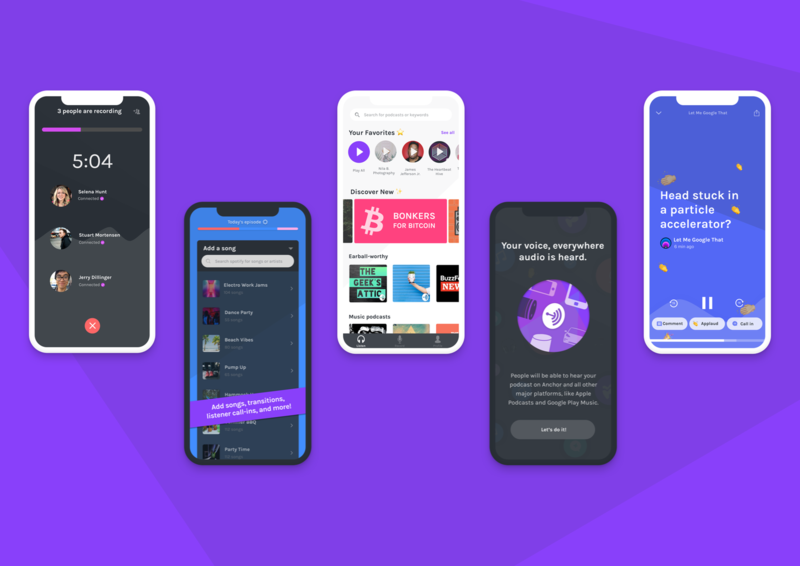 Users can still publish straight to Anchor's platform, and the app will include the ability to browse Anchor's podcasts and follow recordings from people you know. But you can also publish these podcasts to feeds on the aforementioned Apple and Google platforms as well as Overcast, Stitcher and -- as of today -- Spotify. As part of today's launch, Anchor is announcing a handful of notable partners using its new tools, including Buzzfeed, The Outline, Girls who Code and publisher Penguin Random House. The next big part of Anchor's redesign is that the service has a web app for the first time. From there, you can log in and build podcasts the same way you can in the app, with the benefit of more screen real estate. Users can also hook up external microphones, which should make for better-quality recordings than you'll get from your smartphone. And naturally, the web interface makes it a lot easier to upload audio files to your library. People who have experience building their own podcasts in other audio apps can also just upload that finished product straight to Anchor, bypassing the Anchor system entirely. A good reason to do that is the fact that Anchor is now offering free podcast hosting for all of its users. "Hosting podcasts is still expensive... you can pay $75 a month to host a few hundred MB of podcasts, while I can pay $10 to put all of my photos in Google forever," said Anchor CEO Mike Mignano. With free hosting, he thinks that Anchor has removed both the technical and financial barriers to podcasting. "Our view has always been if we're trying to democratize audio we need to remove all friction, including payment," he said. "We don't want money to get in way of people who have stories to tell." Since Anchor can let its users publish their creations to a wide variety of sources, each episode also gets a pretty slick little sharing page that'll include links to all of the different places the episode can be downloaded. Rather than ending up with a link to Stitcher when you prefer using Overcast, Anchor creates a home page of sorts with subscription links to every source where it's available. Mignano said that "things really exploded for us" when podcast publishing was unveiled last summer. The podcasting phenomenon isn't slowing down, and Anchor's new features should be a big deal for those already using the app and may help bring in more new potential podcasters, as well. Another "explosion" may be a lot to ask for, but anyone interested in broadcasting their thoughts to the world should probably give Anchor a look.